Cuini is one of my fun mermaid designs I created for fun one day. She is quite curvy and is a lot of fun to wear around the house or even at a Halloween party. You get step by step instructions with nice clear photos. Included is the line drawing which you can get printed at Kinkos very easily. If you dont want to make a copy, I suggest making a line drawing with a chalk pencil. You can even change the shape to your likings. This design fits best on a large apron which you can find at either Costco or Sams Club. 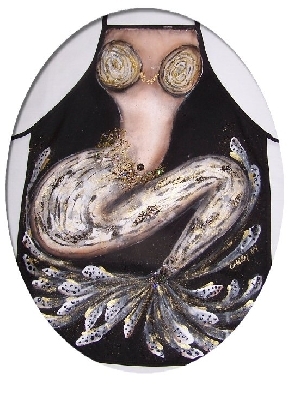 To see more of my apron creations, visit my website at www.wingsnscales.com, click on Mermaids on the left side, the click on Aprons.